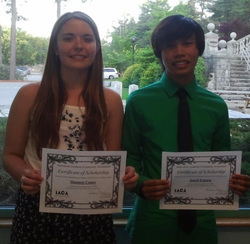 On May 24th at the Junior / Senior Awards Night, the IACA was proud to present two $1,000 Scholarship Awards! The 2012 winners of this years scholarships are Shannon Comer and Jenzel Espares! Judging was based on a point system which rated applicant’s resume, transcripts, recommendation and essay. On behalf of the IACA, we wish the senior class of 2012 all the best in your future endeavors. This is the IACA's second year of providing scholarships to 2 deserving seniors.